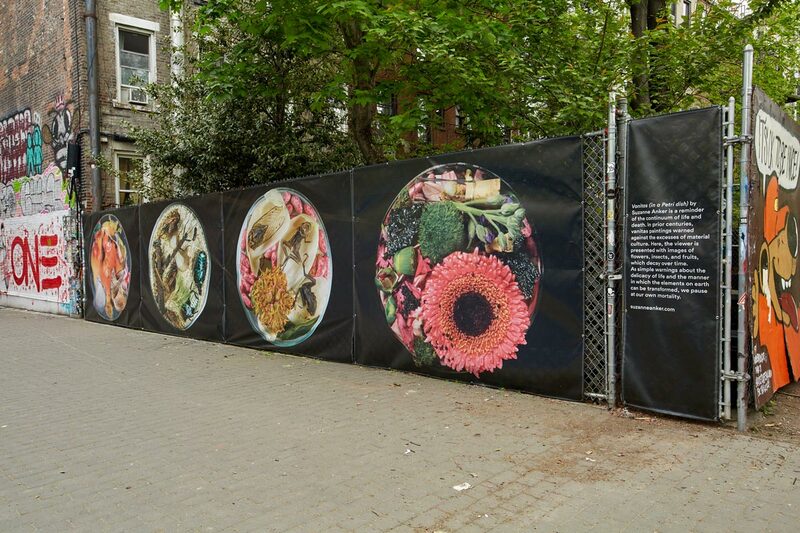 Since 2008, First Street Green has converted a derelict building lot at 33 E. 1st Street in Manhattan into an open art space serving the Lower East Side community. Collaborating with NYC Parks and Partnership For Parks, FSG has successfully incorporated the lot into First Park. Today, FSG provides ongoing cultural activity in First Park by engaging with emerging artists, architects, community and cultural groups through a series of programs that activate this public space. First Street Green presents Vanitas (in a Petri dish) by Suzanne Anker. The installation is a reminder of the continuum of life and death. In prior centuries, vanitas paintings warned against the excesses of material culture. Here the viewer is presented with images of flowers, insects, and fruits, which decay over time. As simple warnings about the delicacy of life forms and the manner in which the elements on earth can be transformed, we pause at our own mortality. Join us for a full day of events including community workshops, murals, music, and art. 1:00 – 4:00 pm: Community Mural School: Learn about the environment by making collaborative art with painters Alex Evans & Anna Souverov. 1:00 – 4:00 pm: SVA flower & plant collage workshop by Suzanne Anker, Chair of SVA’s BFA Fine Arts Department. Ms. Anker weaves traditional and experimental media in SVA’s Bio Art Lab. Restoring America’s shattered national unity one photograph at a time, Mr. Mireles exhibits portraits of Americans from all 50 States from his Neighbors Project on the perimeter fence from May 1-July 7. Live painting by “Wasteland” open call muralists and Centrefuge. New Media artists Carlos Rosas and Leanna Rosas debut “MAMA II: Above Board” – a Media Art Mobile Attack unit on wheels with FSG’s greatest hits projected on the sail.